Calgary Hockey Arenas: What can YOU Find There? Within the city of Calgary hockey arenas are plentiful and the number of choices can be confusing. So if someone asks you to meet up at the hockey arena, be sure to find out which one they mean. 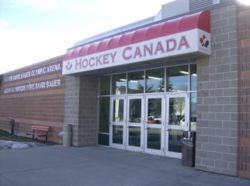 Looking towards ice related sports, there is more than one high-class ice arena in Calgary. This, along with the interest that Calgarians have in ice sports, probably explains why several members of the Canadian speed skating team have historically come from Calgary. If your interest is speed skating, then the chances are you'll want to visit the Olympic Oval, located at the University of Calgary on 2500 University Drive NW. On the other hand, if you're just after a general skate then some casual outdoor place like the pond rink in Carburn Park (Riverbend) or the Bowness Lagoon in Bowness Park is probably a good bet. It's generally open daily between 10am and 9pm you will find it at 8900 48 Avenue NW. These seasonal locations and several others like them are free for the public to use. On the other hand perhaps you're pretty sure that you should be meeting at an indoor hockey arena. In this case you would best head over to Scotiabank Saddledome down at the Calgary Stampede. Scotiabank Saddledome is not only home to the Calgary flames hockey team, it's also where the WHL's Calgary Hitmen and the NLL's Calgary Roughnecks (Lacrosse) play their home games. The city's biggest concerts occur here as well. As you can see, it's "entertainment central". But the Saddledome is not only the biggest of the hockey arenas to watch your favourite game in Calgary, it's also a popular place for music concerts to as well as rodeos and circuses. Just a tip, but if you know that a popular band is coming to play, get your concert tickets early as they usually sell out fast. Shows such as Star on Ice as well as figure skating championships also take place at the Saddledome as it was built to host multiple functions, including hockey. Other major venues include the Stampede Corral and the Max Bell Arena. Then there are dozens of neighbourhood rinks to choose from as well. Indoor and outdoor. As you can see, you're quite flexible for choices with the Calgary hockey arenas. Literally there's something for everyone. And you don't have to be a hockey fan to enjoy, either. Go back from Calgary Hockey Arenas to the Lifestyle Public Relations webpage.